Our family made a new friend on Christmas Eve. We were in the kitchen, looking out at our sunny backyard and watching an assortment of critters as they went about doing whatever it is that critters do this time of year, and I thought it would be nice to give the squirrels a little Christmas present. I scattered a big handful of nuts in the shell on the deck, and then we all waited to see what would happen. It didn't take long for a bushy, gray little fella to show up, his eyes wide when he realized what a gold mine he had discovered, and the four of us were entertained for quite a long while watching the squirrel run repeatedly from the deck to the lawn, where he frantically buried each discovered treasure with his cute little paws. When we bought this house, one of the things that appealed to us most was the large, beautifully treed backyard. Having grown up in Northern Ontario where trees and grass and critters abound, both Matt and I wanted to raise our family with a opportunity to appreciate these wonderful things, and our yard has not disappointed us. The second winter we lived here, we had a very unexpected natural visitor in the week after Christmas, and every year at this time we retell the story and are still awed by it. It was a peaceful winter afternoon; Will was napping, I was out getting groceries, and Matt and Noah were reading quietly. 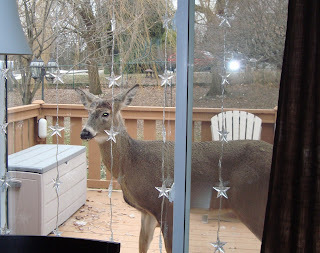 Out of the corner of his eye, Matt noticed something go past the dining room window and thought it might be a raccoon, until the heard the sound of something clomping on the deck (and realized that if that was a raccoon, it was an unnaturally large one!) When he went to investigate, he was shocked to see a deer staring at him through the kitchen window. He called Noah over to see the incredible sight, and the two of them watched her in disbelief (and thankfully photographed her so I could see her later) while she stood silently looking back at them for several minutes. Eventually, she darted off the deck, gracefully jumped over our five-foot fence, and disappeared, leaving Matt and Noah with an amazing story to tell when I returned home. We have always wondered where that beautiful creature came from, how she found her way into our city yard, and whether she made it back to her own home safely once she left ours. (We sure hope so.) When I look into the deer's deep brown eyes in the photograph, I am filled with a sense of peace and I can imagine the earth must have seemed to just stand breathlessly still for those moments that she stood there, gazing in at us. The boys both wondered afterwards if maybe she was one of Santa's (rein)deer who had come to pay us a visit and I can understand why they thought so. Seeing such a gorgeous, gentle creature up so close must have felt like some special kind of magic. I love that our family has so many opportunities to watch in wonder the many creatures who share our yard with us. Living among the cardinals and blue jays, the rabbits and chipmunks, the birds of prey, the mice and even the skunks has given us a delightful subject for regular family conversation and a deep appreciation for the richness of our country's natural beauty. These lovely wildlife friends are truly a special gift for our whole family all year round.